BMW will offer a sub-100g/km variant in the revised 3 Series range, as well as a new three-cylinder petrol engine, boosting its appeal with company car drivers. The best-performing model in the range, the 163PS 320d ED saloon, now has CO2 emissions from 99g/km for the automatic version (manual: 102g/km), matching 163PS variants of the new Jaguar XE. The standard CO2 output of the 190PS 320d is 111g/km, the same as for the 150PS 318d, while the 116PS 316d offers 109g/km. 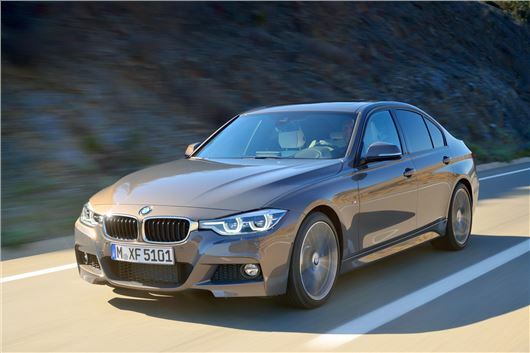 A new 1.5-litre turbo-charged petrol engine, priducing 136PS, now powers the BMW 318i, with CO2 emissions from 122g/km (manual: 124g/km), while the automatic version of the 184PS 320i has CO2 of 129g/km - below the 130g/km writing down allowance threshold that offers benefits to leasing company buyers as well a fleets that buy cars outright. A new plug-in hybrid variant, the 330e, is also in the pipeline, with CO2 emissions of 49g/km, putting it in the current lowest BIK tax band of 5%. Exterior and interior revisions are subtle in the mid-life update, although there is technology available that is new to the 3 Series, including a head-up display, and parking assistance for parallel and reverse parking into car park bays. The revised saloon and Touring range will fgo on sale in July, with prices to be confirmed nearer the time. Figures for saloon models; automatic transmission models in brackets where different.